This week I want to share a print with you from an Etsy shop called thewheatfield. She has a wonderful bright color pallet and great words that speak in each print. This shop was one of the first that I hearted on Etsy so I felt like it was a good fit for my first pick! 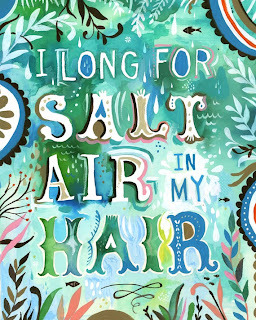 Living on the ocean my whole life this piece just speaks to me, nothing like that first dip into the salty sea each summer to rejuvenate you!